Today, Ireland and the Irish diaspora around the world celebrate St Patrick’s day. It is a day that commemorates Saint Patrick and the arrival of Christianity to Ireland. People celebrate today by attending parades, wearing green and/or shamrocks and drinking mostly Irish beer, like Guinness. While I was a student in the UK I remember how I, driven by my Irish friends, was waiting in anticipation for this day to come. It seemed that everyone used to get into a super-friendly, happy mood, with some kind of leprechaun clothes and Guinness inspired hats, courtesy of pubs after the consumption of pints of that particular irish stout. It was a day of celebration. 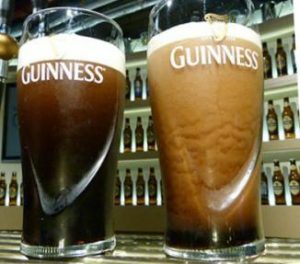 As I am a fan of bitter drinks I cannot but remember the first time I was introduced to a pint of Guinness on St Patrick’s day. Yes, I admit that I was a bit shocked by the size of the pint glass but I was amazed by the magic the liquid was doing while trying to settle in to the glass. When my friends told me I had the all clear to taste it, I had a sip and I was left breathless. Its smooth creamy top combined with the bitterness of the actual thick dark liquid was a match made in heaven. My taste buds started dancing in anticipation for more. The extra bitterness did not put me off like many thought it would but, on the contrary, created a love-at-first-sip which lasts ever since. But wait a minute! I am a woman. And women aren’t supposed to drink beer, are they? Or let me rephrase it, it is not socially acceptable and feminine enough for women to drink beer, is it? There is this stereotype about women and beer drinking that goes on for many years. Advertising campaigns always protruded beer in a very masculine way. Hard working men drinking beer after work, or men surrounded by bikini women while enjoying a cold beer. I can never remember a single beer advert that appealed to women. A specific brewery made an attempt to introduce a “female-friendly” beer, in pink color(!!) and it failed. Why? Because beer doesn’t need to be pink to appeal to women, it just needs to be introduced right. Women like me, who like beer, know that if you and your boyfriend go to a bar and ask for a vodka and a beer, the bartender automatically assumes that the beer is for your boyfriend and not you. Maybe it means that women cannot appreciate the beauty behind beer? Because there is definitely a beauty behind beer making if we consider the more than 400 varieties of beer brewed worldwide. The truth is different. The primary reason behind it starts from us, women. The first thing that a significant number of women think when the word “beer” comes into their mind is a beer belly. Still, is this true? Will you develop a beer belly if you drink beer? 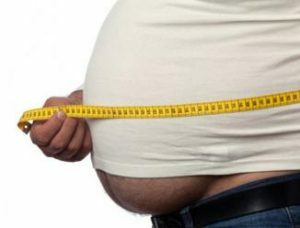 The truth is that beer belly is not the cause of beer consumption. There are many beer drinkers that have no beer belly whatsoever. The reason behind beer belly is calories. People that consume many calories tend to have fat deposited around their waist. It is large alcohol consumption in general and not beer drinking per se that is associated with bigger waists. When you drink alcohol, your liver burns alcohol and not calories that build up in your body. Moderate drinking is what we should all go for; for women, one drink per day is more than enough according to the U.S. Department of Agriculture’s 2010 Dietary Guidelines. And, of course we need to refrain from any side-orders that go with it because these are causing most of the harm on your fight-against-belly-fat. And if you think beer has many calories think again. Guinness, the most consumed beer of today’s celebration, has approximately 210 calories per pint (568ml). The drink that many women often go for while out and about is wine. Red wine has 85 calories per glass (85ml) and dry white has 77. So, if you do the maths, the same amount of Guinness has less calories that the same amount of wine. Also, know that beer can boost your levels of vitamin B6 and B12 and folic acid. Some also actually think that a small glass of Guinness per day can help promote lactation in breastfeeding moms but further research is necessary on the matter. 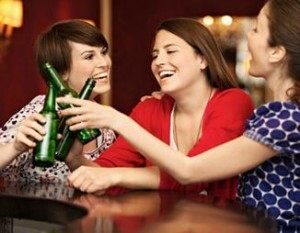 The second reason why women are not drinking beer is that it is not socially “correct”. There is this notion in many people’s mind that a glass of wine is more “appropriate” for a woman whereas beer is for tough, macho men. In addition, quite mistakenly many assume that if a woman drinks beer its because she wants to get drunk fast due to a fight she had with her partner etc. Is it so strange for a woman to actually drink beer because she appreciates the actual drink? Why do I have to drink wine, vodka or gin to “be” super feminine, refined and genteel and not a “drunk, miserable, probably misbehaved” woman who drinks beer? Why drinking wine, unfortunately even today, is considered by many narrow-minded people, often women, a way to show that they belong to higher socioeconomic groups that “NEVER” drink beer? Well, there should be no whys. All these are false stereotypes that have been involuntarily part of our perspective towards women and beer. I drink beer and I enjoy it for what it is, an alcoholic beverage made by fermentation of grains and is rich of texture and aromas. I love a pint of Guinness when the weather is cold as much as I love a glass of red wine. I love a “blonde Warsteiner” (calm down, ladies, it is not at all sexist to call a beer blonde; it’s the truth) during summer time as much as I love a glass of extra chilled dry white wine. Does this make me less of a woman? Or, does it state something about my socioeconomic status? No, and certainly not. If you like beer, you are free to drink it regardless of any fake “status quo” people might like to believe. It is as simple as that!